Note: It’s obvious I haven’t been posting often this year, and I don’t plan to write much here in the future either. But it’s been a great ride. My plan over the next several weeks is to share some of my favorite or most popular AMF posts. The first two, however, are new ones to the site — articles I wrote for the United Cardinal Bloggers postseason publications in 2012 and 2013 and both, unsurprisingly, on Chris Carpenter. First up, from “An Unexpected Journey,” which is still available to purchase. As you flip through “The Legend of Chris Carpenter,” you’ll notice the elements that make any story a compelling read. Sure, there are chapters on his high school days excelling at both hockey and baseball in New Hampshire, as well as the start of his professional baseball career in 1994 and the six seasons as a Toronto Blue Jay. But those chapters basically serve as a prologue. “The Legend of Chris Carpenter” doesn’t really begin until he arrives in St. Louis. Those chapters provide quite the page-turner: good times and one-hitters and a Cy Young Award (and a coulda-been-second one) plus of course two World Series championships, combined with bad days and shoulder problems and elbow issues, Tommy John surgery and seasons (plural) lost to injury. Plus a role in that brawl in Cincinnati. After all that, did this legendary tale really need more dramatics? Yes, said the baseball gods. Yes, it did. And thus we arrive at Chris Carpenter’s 2012 season. It began in February at spring training and without drama. Given the career-high 273 1/3 regular and post-season innings he pitched in 2011, plans were for him to have a modified workload in Jupiter, Fla. He was even mentioned by manager Mike Matheny as the likely Opening Day starter. The start of turmoil followed Carpenter’s first time facing hitters, when persistent neck stiffness came afterward. That brought testing in early March, along with speculation about a recurrence of the nerve issues he suffered late in 2004 and 2008. On March 11, general manager John Mozeliak announced Carpenter’s pain was from a bulging disc in his neck, as well as that contingency plans were being put into place in case Carpenter couldn’t start the season. A glance at the March headlines from the Cardinals website summarize Chris Carpenter’s month quite well, and takes you on a rollercoaster ride. April and May passed like the pages of a daily calendar flipping quickly, interrupted by an occasional update that Carpenter’s strength and conditioning work continued. Mid-June brought positive progress: throwing off a mound, then bullpen sessions, up to facing teammates in live batting practice on June 22. Things looked good … but again only briefly. Which was why he was back throwing from the bullpen mound a day later in 102-degree St. Louis heat. His throwing session after that, however, was canceled. And on July 3 it was announced he would undergo surgery – season-ending surgery, of course it was called, because it involved “removal of his first rib, the release of two scalene muscles in his neck and freeing the nerves that make up his brachial plexus, a bundle of nerves that runs from his neck beneath his collarbone to his shoulder,” according to Joe Strauss. Successful surgery was performed by Dallas specialist Dr. Gregory Pearl on July 19, and “a recovery of 2-3 months was prescribed, allowing Carpenter to carry out a normal off-season program, barring complications,” Joe Strauss wrote the following morning. Of course, Langosch and the rest of us surmised that “a little ahead of the game” meant for spring training 2013. Because during his recovery time, is where the legend – unknowingly then to the rest of us – began to build. It started simply: Carpenter traveled with the Cardinals to Philadelphia for an Aug. 10-12 weekend series. He continued to travel with the team, and threw from the bullpen mound in Pittsburgh on Aug. 28. Then, next time out on Aug. 31, he faced hitters. Because, as he himself said, why not push it? For the rest of us, of course, the answer would be “because I just had a rib removed about six weeks ago.” But the rest of us aren’t Chris Carpenter. There’s only one of him. The next day – after the Cardinals’ win put them into the second wild card spot – the official announcement was made: Chris Carpenter would start that Friday, Sept. 21, against the Cubs in Chicago. And here is where this chapter in The Legend grows. Anticipation grew throughout the week. Fox Sports Midwest debuted a striking-yet-simple commercial with Carpenter’s own words from recent months – such as “I’ll do whatever it takes to get out there again” and “I don’t take a day off” – set in white against a black background as the equally striking strains of NEEDTOBREATHE’s “Keep Your Eyes Open” swelled in the background to promote “Chris Carpenter Returns – Friday 12:30 p.m.” We learned just what happened to his removed rib: he kept it, at his daughter’s request, and it was in a jar at home. Tickets were purchased by many fans for the game at Wrigley, travel plans were made … It was easily the most anticipated regular-season Cardinals game since perhaps Rick Ankiel’s debut as an outfielder in 2007. The day arrived, gray and rainy and cool. Of course sunshine and warmth would have added to the ambience, but the crowd of Cardinals fans in the ballpark – which included me – didn’t care. 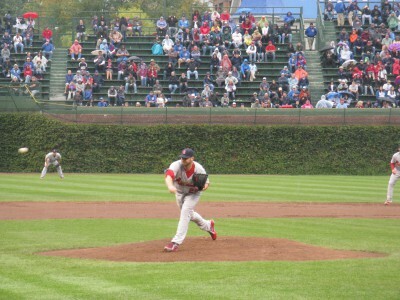 Moments after Matt Carpenter launched a long fly ball to Alfonso Soriano in left to end the top of the first, Chris Carpenter emerged from the dugout for the short trip to the pitcher’s mound. He made his warm-up tosses and walked to the grass just behind the mound before returning to set himself and deliver his first pitch of 2012, two months and two days after surgery. Life, as the saying goes, is about the journey and not the destination, and the 2012 chapter in “The Legend of Chris Carpenter” is about the journey as well – the journey to making his first start, that first pitch, of the 2012 season. And legends are not the same as fairy tales. If they were, Sept. 21 would have ended appropriately with a win for Carp as a reward for his journey to those five innings, 77 pitches and exiting with a 4-2 lead – not the tortuous blown-save-that-led-to-a-walk-off-single-and-oh-no-please-not-”Go-Cubs-Go” reality. 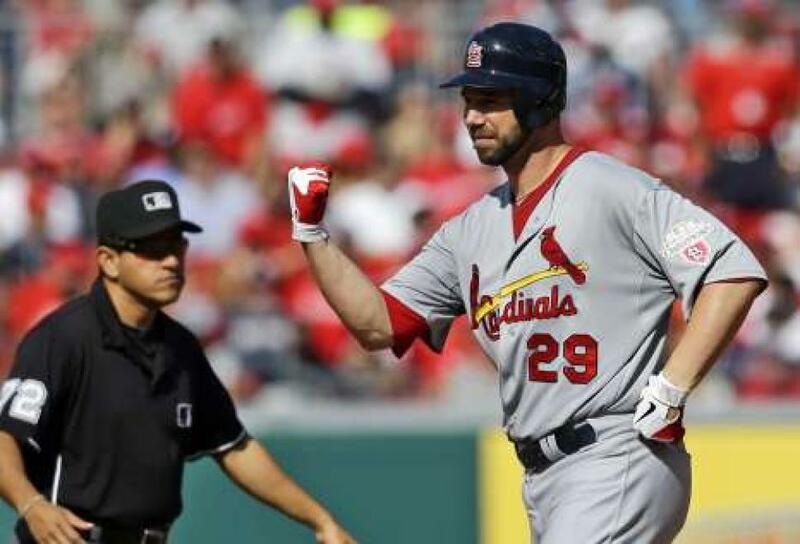 If they were, Carpenter’s next start – a return to the pitcher’s mound in Houston where his most recent visit had been 2011’s Game 162 – would not have resulted in this time the Cardinals being shut out as he gave up two runs on four hits in six innings. If they were, his return to the Busch Stadium pitcher’s mound on the night the Cardinals ultimately clinched the second wild card spot with the help of, ironically enough, the Giants would have had better results than a second Carp L after he allowed three runs on seven hits with seven strikeouts in six innings. There were small glimpses of 2011-era Chris Carpenter, the occasional cutter or curve that was rewind-the-DVR-worthy for another view. There also was a lone victory, Game Three of the NLDS in which the Cardinals pounded the Nationals 8-0. His two starts against the Giants in the National League Championship Series? Never mind. In the end, 2012 in “The Legend of Chris Carpenter” was about one thing: resilience. It’s a trait that’s occurs much throughout the chapters of his story thus far written, with all the turns and twists the saga has taken through 16 years in the big leagues. The ultimate result of 2012, those numbers appearing on his Baseball Reference page, don’t have the capacity to explain how resilience was what the year was about. Because numbers only tell part of the story. This entry was posted in 2012 Season and tagged Chris Carpenter by Christine Coleman. Bookmark the permalink.